Despite the fact I also spent several years of my life in the kindergarten I am one of those who love oatmeal. It must be because my most serious kindergarten impression came from boiled eggs with normally grayish blue yolks. In the shade of them, I was lucky to not even notice the quality of oatmeal. I say lucky because now oatmeal turned into one of my favorite breakfasts. It's fine cooked at home and in some of Moscow cafes. I like it in Le pain quotidien served with honey and butter. It's also fine to take away from Prime Star. To add to that whenever something is wrong with my stomach, that's what I eat. No other food feels so clean and comforting. When I do make it myself, I prefer it thin. That's where I had my second struggle over whether to write about it. How was I going to take pictures of thin oatmeal? It seemed like a way to surely get into trouble. I even thought about making a thicker one for the post, but what sense would it make? Here it should be real, as I really like it. So here it is as it is and I hope some of you will enjoy it. 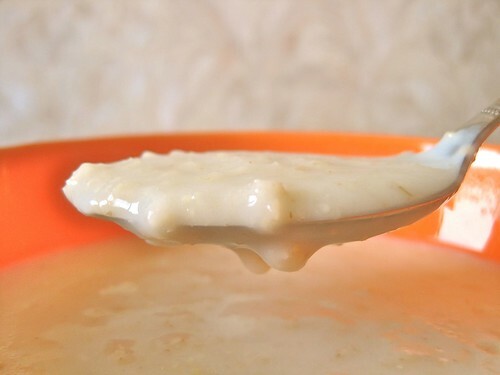 Combine milk, water, oatmeal, salt and sugar in a small souse pan. Set the pan over high heat and bring to boil. Reduce the heat to small, put a lid on and cook for 6 minutes. Remove from heat. Let it rest 5 minutes under the lid if you can. Then add some butter and enjoy. Isn't it amazing? I still cheated you with pictures though. In reality it never gets into a bowl. I can't explain it, but it is somehow 3 times more tasty if you eat right from the pan. My parents were from Scotland, so porridge is something my wife cooks for me every morning here in St Petersburg Russia. Contrary to Scottish custom, we don't worry if it isn't stirred in a clockwise direction, I don't stand up while eating it, and I skip the wee bit of whisky! I pour loads of milk on top, after first adding honey. Larissa first slices and boils some tikba (pumpkin), then adds Ясно No. 1 oats. The baked pumpkin oatmeal looks scrumptious! I also really like pumpkin in the porridge, but I never tried it in oatmeal, only rice and millet. Now I'm definitely going to try. Thank you very much for sharing this!